Look at you. You’re committed to culture-building on your team. You’ve been working hard all year to do little, everyday things that make a big difference in how your team feels about the work they do and where they do it. You know that happy employees are 12% more productive than those who are unhappy and that 86 percent of employees recognized in the last month say they trust their boss. Sure, it hasn’t all been smooth sailing, but hey, you’re human and you understand that perfection is the enemy of progress. You’ve kept the staff appreciation train on the tracks since August, and that’s not nothin’. And now, it’s Spring. If your district is anything like most that we work with, that means the brutal combination of 1) budgets running low, and 2) staff burnout running high. One look around your staff meeting tells you that your people could use a little boost. What’s a terrific-but-strapped admin to do when grand displays of staff appreciation aren’t an option? Why, download our Celebrate Your Staff on a Shoestring resource, of course! 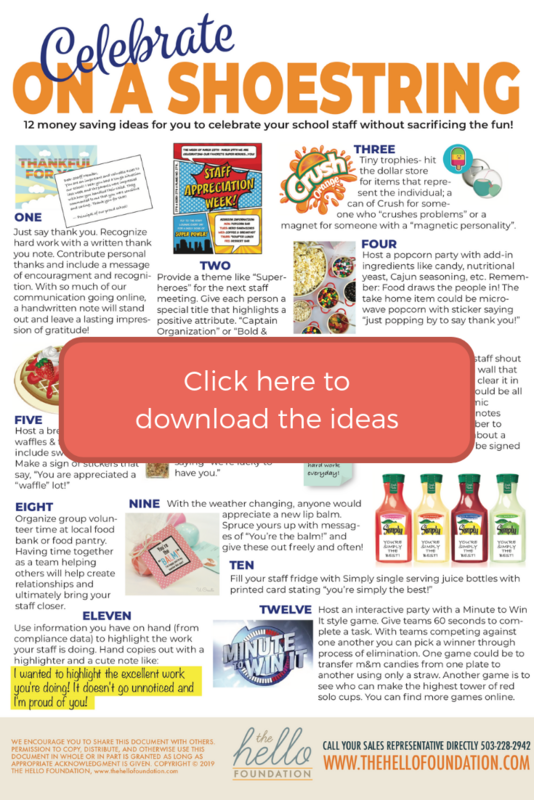 We’ve assembled 12 free and low-cost ideas that will help you celebrate the fantastic work your staff is doing and will encourage them during this final push to the end of the year. Click on the image above or click here to download a free copy. We see you and the work you’re doing to make your district a place that staff wants to stay. You got this, and we’ve got you!